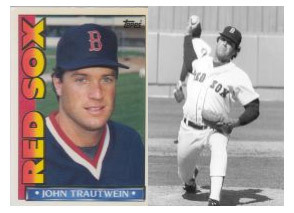 Former Boston Red Sox (& Pawtucket Red Sox) pitcher and founder of the Will To Live Foundation, John Trautwein, will visit Brentwood, NH on the 24th May, 2013 for a speaking engagement. John will share his personal inspirational story on the WTL Foundation’s teen focused “Life Teammates” program with the Seacoast New Hampshire community and it’s local youth sports organizations. Members of local youth groups, schools, park districts, coaches, teachers and of course, the kids of the Brentwood community have been invited to attend this inspirational presentation on turning tragedy to triumph. John and his wife Susie, the co-founders of the Will To Live Foundation, a nonprofit public charity, introduced their “Life Teammates®” program shortly after the tragic suicide death of their oldest child and son Will Trautwein, back in October, 2010. “We all have Teammates in our lives today. Someone we share or have shared a dream with, someone we go through successes and failures with. The Life Teammates Program teaches kids to recognize those Life Teammates now – and encourages them to turn to each other in times of need” Says John, who played pro-baseball for 7 years after graduating from Northwestern University where he played with Yankees Manager Joe Girardi. John spent 4 years in the Expos organization and 3 years with the Red Sox organization including being a member of the 1988 Boston Red Sox pitching staff. The Life Teammates message has now been shared with over 30,000 teens and young adults across the nation and continues to grow. Several local New Hampshire teams are sharing the message today – The Dover Stars Bantam Major hockey team as well as the Exeter Junior Bambino Baseball League recently joined the program spreading it’s “good teams may win, but great teams love each other” message. John’s New England – Will To Live Tour – will continue the very next day (Sat 5/25), when he’ll be in Exeter, NH for the first ever running of “Connors Climb” – a 5k Family Fun Run & Walk For Life – which is sponsored by the Will To Live Foundation and is expected to be a wonderful family event designed to raise awareness and hope to the greater Exeter community. All proceeds raised will go back into the Exeter community raising awareness, education and counseling for teen suicide and mental health programs. For more information – view the official “Connors Climb” post. On Sunday the 26th in Boston, it is “New Hampshire Day” at Fenway park and John has been asked by the Red Sox to man their alumni “Autograph Alley” booth before the game (1:35pm game time). He’ll have with him “Life Teammates” wristbands to give to all autograph seekers as well as more information on the foundation and it’s programs – as he hopes to continue spreading the “Love Ya Man” message. Please contact the Will To Live Foundation at [email protected] to arrange for John to speak to your organization today. Will To Live Co-Founder and President John Trautwein (shown above) has made over 200 speeches to kids, teams, schools, youth groups, teachers, coaches and parents alike since the Foundation was formed in late 2010.